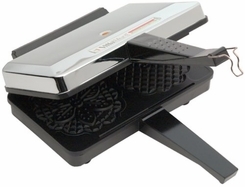 The electric Prima Pizzelle Iron makes delicious Italian pizzelles in the traditional fiori pattern. Serve the thin 5-in. wafers flat as cookies or a base for desserts, or shape them fresh from the iron into cones or cups. This double iron turns out 2 pizzelles in 30 seconds. Features ready light, automatic thermostat, long, stay-cool handles and steam guard. Folds and stands on end for convenient storage.